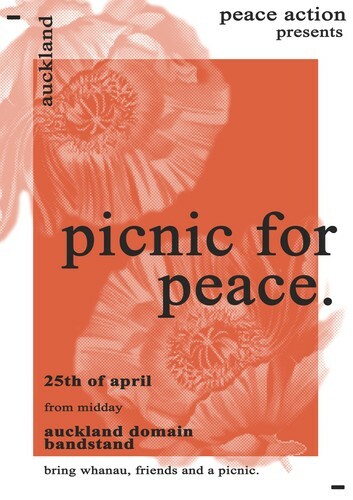 Auckland Peace Action invites you to join us for our third annual Picnic for Peace, an alternative ANZAC Day commemoration that opposes the glorification of war and calls for a just and lasting peace based on demilitarisation, decolonisation and justice. We will be meeting at Pukekawa (the Auckland Domain) for prayers, speakers and a picnic to coincide with the civic service at the cenotaph. This year’s theme for the Picnic for Peace concerns New Zealand’s continued military involvement in Iraq and Afghanistan. New Zealand has had a military history of invasion and occupation in the Middle East from the First World War onward. Contrary to popular mythology, New Zealand has served the interests of empire and oppressed the people of the Middle East, from our first occupations of Palestine and Egypt, to our assistance in invading Iraq and Iran to access oil reserves, to our current deployments that have lasted 15 years and 18 years respectively. In June the future of our military involvement in Iraq and Afghanistan come up for consideration by the government. In the spirit of justice, peace and self-determination, we will make use of ANZAC day to call upon the government to withdraw their troops from Iraq and Afghanistan and allow those countries that have been so wounded by us and our imperialist policy to rebuild in peace. We will meet at 12 PM on April the 25th by the Auckland Domain Bandstand. We encourage you to bring family and friends and bring food to share as we listen to speakers, pray and discuss.